3 What is the basis of Settlement? Contract Works Cover One We will pay for the reinstatement of the works to a condition that prevailed immediately prior to the loss or damage. Owned Plant and Machinery Cover Two If there is a total loss we will replace the property or pay for the loss or damage in money. This is limited to the market value of each item. If there is a partial loss we will pay for the cost of repairing the item up to the amount that would be paid had there been a total loss. Hired In Plant Cover Three We will cover the Insured s legal liability for loss or damage and continuing hire charges resulting from this loss or damage under the hiring agreement or otherwise. Where the plant is over one year old, this liability is limited to the liability under the Model Conditions for the hiring of plant approved by The Construction Plant hire Association. What are the main Exclusions? For Cover One: Loss or damage caused by defective design, material or workmanship Existing property Damage to any part of contract works caused by its own breakdown or explosion except during testing/commissioning Loss or damage for which the Insured is not responsible under the terms of the contract For All Covers: The policy excess Loss or damage occurring during transit by air or sea Wear and tear Vessels, craft, vehicles or devices designed to float on in or travel under or through water, air or space Inventory losses Damage to property arising from multiple lifting operations Any consequential losses such as penalties for delay Motor vehicles unless primarily for use as a tool of trade Terrorism and E risks Pollution and Contamination The above detail is a summary of the cover provided under our standard contractors all risks policy. 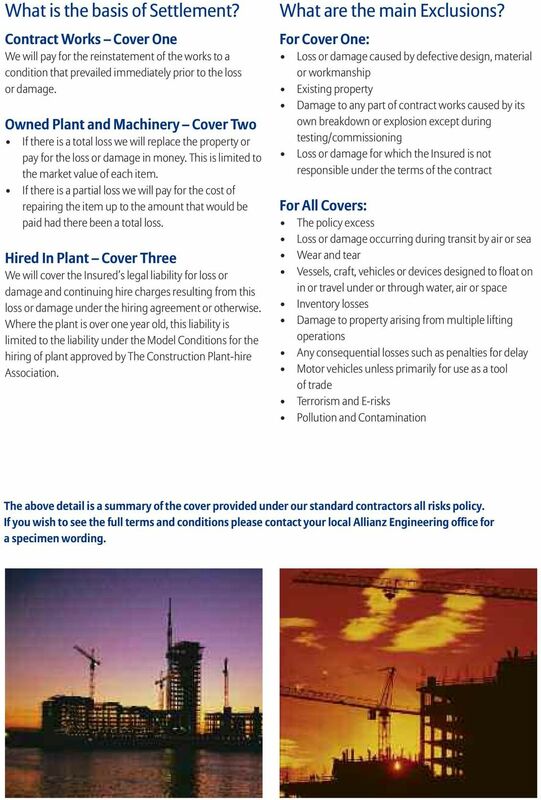 If you wish to see the full terms and conditions please contact your local Allianz Engineering office for a specimen wording. 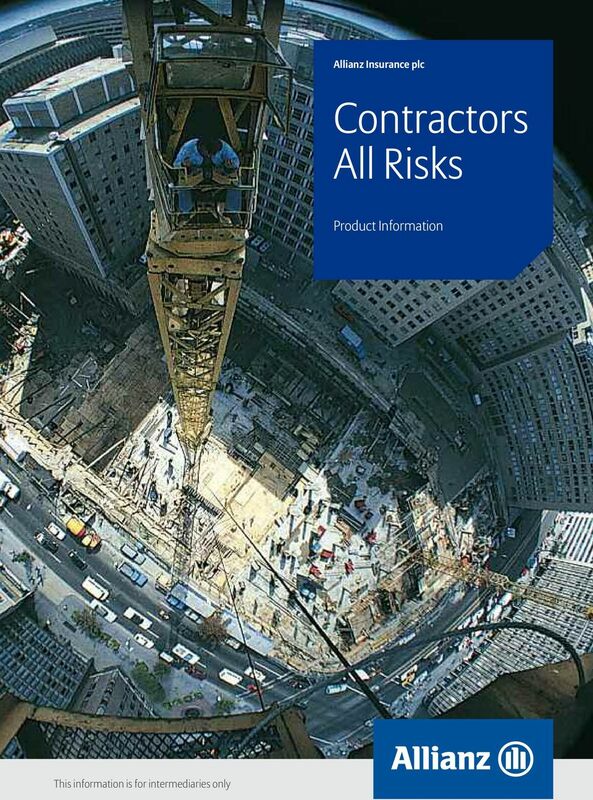 4 Why should your clients buy Contractors All Risks cover from Allianz Engineering? 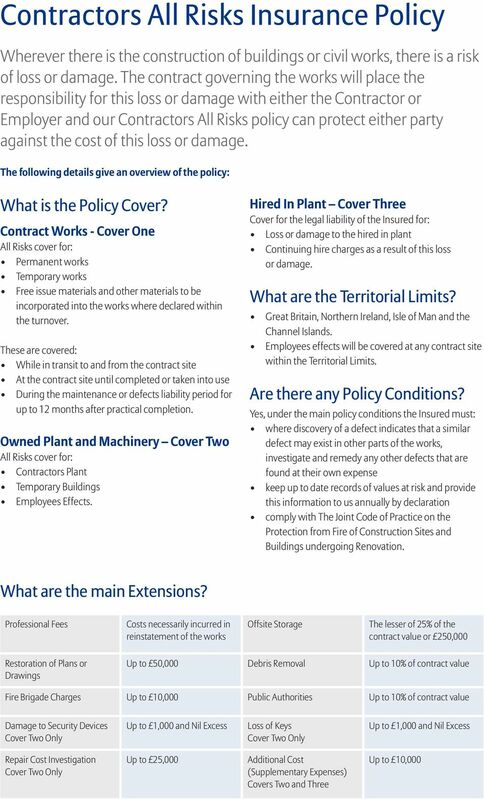 The main features and benefits of our Policy wording are: Insured Property Joint Names Transit All Risks cover for: all permanent and temporary works undertaken in performance of the Contract Works as well as free issue materials and other materials allocated to or incorporated into the works where declared within the turnover. all Owned Plant and Machinery. 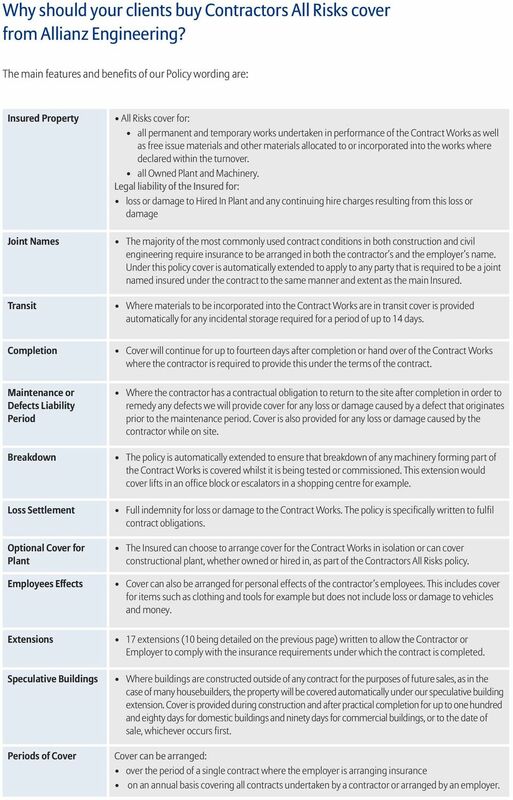 Legal liability of the Insured for: loss or damage to Hired In Plant and any continuing hire charges resulting from this loss or damage The majority of the most commonly used contract conditions in both construction and civil engineering require insurance to be arranged in both the contractor s and the employer s name. Under this policy cover is automatically extended to apply to any party that is required to be a joint named insured under the contract to the same manner and extent as the main Insured. Where materials to be incorporated into the Contract Works are in transit cover is provided automatically for any incidental storage required for a period of up to 14 days. Completion Maintenance or Defects Liability Period Breakdown Loss Settlement Optional Cover for Plant Employees Effects Extensions Speculative Buildings Periods of Cover Cover will continue for up to fourteen days after completion or hand over of the Contract Works where the contractor is required to provide this under the terms of the contract. Where the contractor has a contractual obligation to return to the site after completion in order to remedy any defects we will provide cover for any loss or damage caused by a defect that originates prior to the maintenance period. Cover is also provided for any loss or damage caused by the contractor while on site. The policy is automatically extended to ensure that breakdown of any machinery forming part of the Contract Works is covered whilst it is being tested or commissioned. This extension would cover lifts in an office block or escalators in a shopping centre for example. Full indemnity for loss or damage to the Contract Works. The policy is specifically written to fulfil contract obligations. The Insured can choose to arrange cover for the Contract Works in isolation or can cover constructional plant, whether owned or hired in, as part of the Contractors All Risks policy. Cover can also be arranged for personal effects of the contractor s employees. This includes cover for items such as clothing and tools for example but does not include loss or damage to vehicles and money. 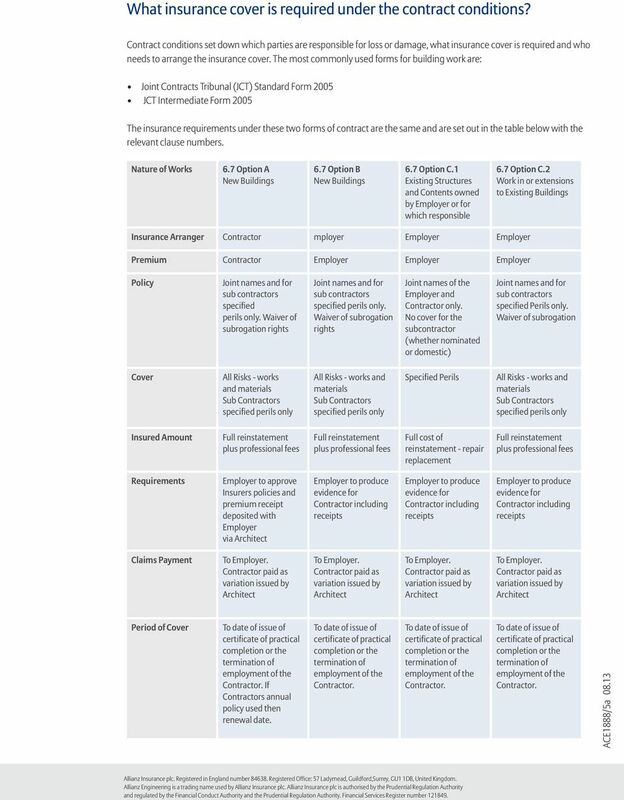 17 extensions (10 being detailed on the previous page) written to allow the Contractor or Employer to comply with the insurance requirements under which the contract is completed. Where buildings are constructed outside of any contract for the purposes of future sales, as in the case of many housebuilders, the property will be covered automatically under our speculative building extension. Cover is provided during construction and after practical completion for up to one hundred and eighty days for domestic buildings and ninety days for commercial buildings, or to the date of sale, whichever occurs first. Cover can be arranged: over the period of a single contract where the employer is arranging insurance on an annual basis covering all contracts undertaken by a contractor or arranged by an employer. Insurer Thistle Underwriting acting in an underwriting capacity on behalf of those Lloyd s Underwriters subscribing to the above policy. Please read this document carefully. Full terms and conditions can be found within the Policy Booklet. M & C General Insurance Company Ltd.
Bodily injury, death, disease, illness, mental injury, mental anguish or nervous shock.